FRED DE SAM LAZARO, correspondent: This is what’s left of Rana Plaza, the seven-story building that collapsed in April: a memorial, already weathered by heat and monsoons, to the deadliest of Bangladesh’s recent garment factory disasters. The death toll here: 1,127 and counting. 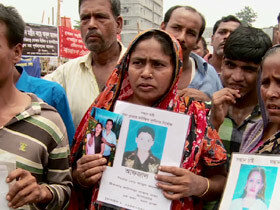 Many victims of the Rana Plaza tragedy may never be accounted for. More than 200 bodies, some decomposed beyond recognition, had to be buried before they could be identified. BILQUIS: (through translator) I’m tired, I have no energy to look for her any more. I don’t know where to go. DE SAM LAZARO: An anguished crowd bearing images of loved ones quickly gathered around us. Bilquis’ daughter Shahinoor is among those missing. Many here gave DNA samples in hopes a match could be found with someone buried. So far, they said, no word and no compensation. SALMA BEGUM: (through translator) I had two sons and a daughter-in-law working on the second floor. We got the bodies of my older son and daughter-in-law but they haven’t found my younger son. JOSNA AKHTER: I don’t know about my future, I have no strength and it is difficult for me to move. I pray to Allah. I want a job, I need to start again. DE SAM LAZARO: Apparel makers—high fashion and bargain names alike—have been lured here by the low wages. The minimum wage is just $37 a month. In barely two decades, Bangladesh has become second only to China in garment manufacturing. But all this has come at huge expense to workers, says Nazma Akther, a former garment worker, now a union organizer. NAZMA AKHTER: Everybody is cheating the workers. DE SAM LAZARO: Everybody is cheating the workers? DE SAM LAZARO: Are not paying a fair price to the manufacturers? 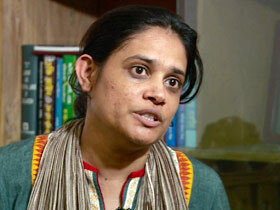 NAZMA AKTHER: Even the manufacturer is not paying proper. Even our government, the law enforcement also is not properly implement, these are the problems. DE SAM LAZARO: She and many others blame Rana Plaza—and several factory fires before it—on poor enforcement of safety rules and the suppression of labor unions, issues the U.S. government cited last week as it suspended trade privileges for some Bangladeshi imports. The move does not directly impact garments, but there’s fear it could drive away investors. Fazle Abed is founder of the Bangladesh Rural Advancement Committee, or BRAC, the world's largest antipoverty organization. FAZLE ABED (Founder, BRAC): There is certainly more awareness everywhere that we need to do something very quickly, otherwise Bangladesh might lose a lot of business. So that is there among the industry owners. The government is certainly under pressure. DE SAM LAZARO: For its part, the government says it will train 400 new inspectors. It has just 18, overseeing 5,000 factories in homes, in rapidly built high-rises like Rana Plaza. 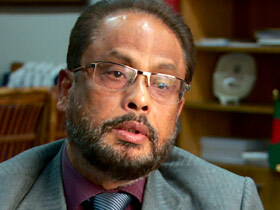 Commerce minister Ghulam Quader says the industry grew much faster than the capacity to regulate it. And, he admits, it didn’t really want to regulate much. DE SAM LAZARO: The government favored the manufacturers. QUADER: Manufacturers in a way that, yes, so that’s why we try to restrict labor union activities. Government wanted to see the peaceful development of the sector. DE SAM LAZARO: He says unions will now be allowed a greater voice to help monitor safety, something BRAC’s Abed has urged. ABED: Only a couple of months ago, if you asked a garment industry owner what do you think of a union, they will say no, no, no, no unions. But now, many of them are saying that yes, maybe the union is something that we have to accept. DE SAM LAZARO: But factory owner David Hasanat says it’s western buyers who really hold the cards, and they continue to squeeze local producers. After previous disasters, like a string of fatal factory fires, he says there was talk but no action. DAVID HASANAT (Viyellatex Group): Couple of months, lot of media, international media. 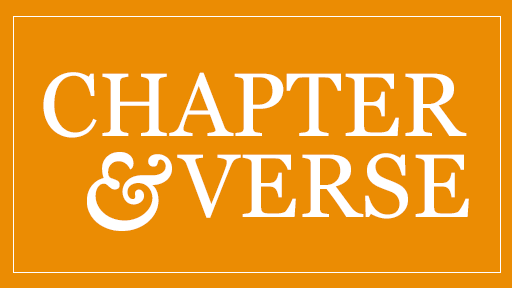 Believe me, few months later, the customer, they act the same way—the price, price, price. DE SAM LAZARO: (at factory) What is your share of this £9 price tag? HASANAT: Roughly, something like £2. DE SAM LAZARO: He says there’s unrelenting pressure from buyers to cut costs. So many producers cut corners. Perhaps a third of Dhaka’s factories are substandard, he says, and western clients could change this if they insisted on better conditions. HASANAT: If there is demand, everybody would set up the right kind of factory because business is not going to reduce. The prices we’re offering, we’re getting from Bangladesh, you cannot get from other parts of the world, you have to come to Bangladesh. DE SAM LAZARO: Major brand buyers say they have stepped up their own plant inspections, though none would allow us to go along on a visit. NAZMA AKTHER: You should buy our clothes and pay fair and everybody has the responsibility, the government, manufacturer, retailers, as well as the consumer. 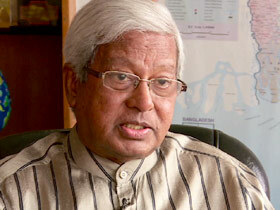 DE SAM LAZARO: For all its faults, Fazle Abed says the garment business remains the best option for poor Bangladeshis. ABED: It’s created about four million jobs, almost more than three million jobs for women. So it is very critical. DE SAM LAZARO: He’s hopeful the sheer scale of Rana Plaza will finally force retailers to coax consumers to pay more and require factory owners to both improve pay and safety conditions. For Religion & Ethics NewsWeekly, this is Fred de Sam Lazaro in Dhaka, Bangladesh.